Kitchen herb gardens are reasonably common around the city, but rare is the garden that contains lovage—a robust perennial herb that looks and tastes like celery. “It has a savory quality and is the kind of herb that gives food a depth of flavor and a deep, herbaceous vegetable note,” says Jerry Traunfeld, chef and owner of Poppy, on the north end of Capitol Hill. That pop of flavor can be used to perk up vegetable stocks, enliven a bowl of steaming shellfish or fortify salads. Traunfeld often uses lovage as a finishing herb, or chopped fine and added to soups, although he says a little goes a long way. “It’s strong, and you have to use it carefully,” Traunfeld warns. “It’s an herb that can get bitter, especially if you’re using older leaves, when it’s more mature.” Leaves are best when picked young and tender; cutting back the plant regularly through the year helps to encourage new growth. Where he gets lovage: Behind Poppy, Traunfeld and his kitchen team grow several clumps of lovage in raised planters. “I also planted some at my house for emergency backup,” he says. Where you can find it: “I don’t see lovage at the farmers’ markets very much, so that’s the thing—you kind of have to grow it,” Traunfeld says. Lovage starts can be purchased at Swansons Nursery (Ballard) or the Seattle Tilth Edible Plant Sale and planted in prepared beds or large pots, which will help contain the plant and prevent it from spreading. “Growing lovage yourself is really exciting and so much superior to anything you can buy,” Traunfeld says. How he uses it: Lovage goes well with shellfish, clams, shrimp and scallops. “We use it in the aioli for mussels,” a popular appetizer made up of lightly fried mussels with a dollop of herbed aioli. “We might put it in a carrot salad, because it works well and it’s very pretty with both the green and the orange—they have an affinity, just like in a mirepoix.” Lovage can be sliced into thin strips and used as a finishing herb on fish (Traunfeld recommends halibut), or the leaves can be added to a simple butter sauce. Behind the bar, Poppy bartenders make simple syrup from lovage by juicing the stems, which makes a verdant syrup for sodas. How to grow and harvest it: “The cool thing about lovage is it’s the first thing to come up in spring,” Traunfeld says. It’s a hardy perennial, so plant starts in a permanent garden spot and let new growth come on before harvesting. To harvest, clip small, tender leaves at the base of the stems. Use older, woody stems as sipping straws in summer cocktails. 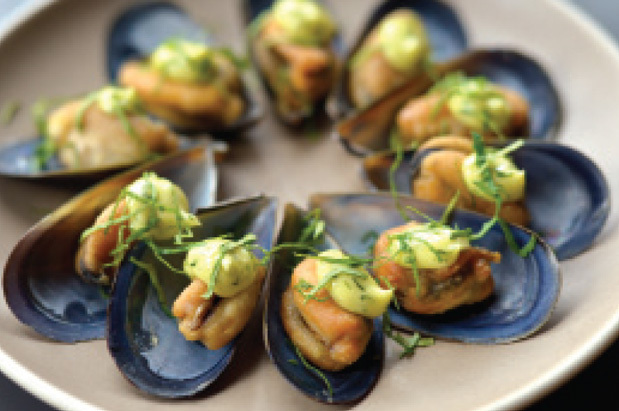 Check out the archives at Seattle Magazine for Jerry Traunfeld's recipe for Pan-Fried Mussels with Lovage Aioli. Days went by, and the bananas started fermenting. You know bananas are fermenting when they start smelling boozy. Then I was leaving on a trip and thought - I have GOT to use these damn things. So I made a quick bread (the lazy bakers ultimate go-to recipe) and wrapped it up for my man to take to work. Of course, I did take 2 slices for the plane ride. Best. Idea. Ever. A few notes about this recipe. I did not precisely measure. I just scooped flour out of the bag without first aerating, tossed in a handful of this or that, didn't measure with tablespoons, just used kitchen spoons etc which is all to say you need not be absolutely precise. you can use any streusel topping you like - I never measure and simply through equal parts of flour:sugar:brownsugar:butter into a bowl and start mashing. I added a bit of cinnamon, but you can add nutmeg, cloves, cayenne, cardamom, crushed chamomile - whatever you like. Preheat over to 350 F/180 C.
Lightly grease a 9x5 loaf pan. In a large bowl, cream butter and sugar together until well combined and light. The sugar—butter combo should be light, white, and fluffy. Add the egg and until well incorporated, making sure to scrape the sides of the bowl.Add bananas, yogurt and vanilla and mix until well combined. In bowl, stir together baking soda, cocoa powder and flour, then add to the mixing bowl and beat until just combined. Do not over-process. Add a handful of chocolate chips and fold in with a spoon. Pour batter into loaf pan. In a medium-sized bowl, combine the flour, sugars, pecans, cinnamon, salt and butter. Using your fingertips, massage the mixture together until it forms a coarse crumb and larger clumps. Sprinkle over top of batter and lightly press into batter. Seaweed comes in various shapes and forms—pressed and dried into sheets for sushi rolls, salted in jars, dried whole and other preparations. “I like them all, but my choice is wakame,” says Kitamura. Dark green wakame is sold in both dried and jarred forms. Sometimes labeled as sea vegetables, it has an almost indistinguishable, subtle taste. The texture is satisfying. “It’s something in between melt in your mouth and chewy,” he says. At Sushi Kappo Tamura, he serves wakame with nattō (a preparation of fermented soybeans that “has an aroma similar to stinky cheese”), cucumber and seafood in a sweet, vinegary sauce. Why you should try it: Wakame is packed with antioxidants and nutrients, including calcium, iron and magnesium—and has a sweet, slightly salty flavor and thick texture. “It is unusual to an American palate, but it’s full of minerals and fiber, plus has zero calories,” says Kitamura. How to use it: Don’t overcook it. “Melted seaweed is not pleasant—it’s like slime,” Kitamura says. Soak wakame for about 10 minutes before tossing it in a vinaigrette made from lemon juice, soy sauce and sugar, and folding it into a green salad. Minced ginger adds flavor. Where to find it: Metropolitan Market (metropolitan-market.com) and PCC; Uwajimaya (multiple locations; uwajimaya.com). About $6 for an 8-ounce package. Salt-preserved wakame should be boiled and strained. Where to find it: Metropolitan Market and PCC; Uwajimaya (multiple locations). About $6 for an 8-ounce package. Salt-preserved wakame should be boiled and strained. 1. Put the dried seaweed into a large bowl, fill it with cold water and soak it for 5 minutes. For more tender seaweed, soak it for 10 minutes. 2. To make the dressing, combine the rice vinegar, lemon juice, oil, mustard, salt and pepper in a small bowl and whisk together. 3. Drain the seaweed and use your hands to squeeze out excess water. Wipe out any excess water in the bowl, and then return the seaweed along with the cucumber and the dressing. 4. Toss thoroughly to combine. 5. Plate the salad and place the shrimp on top. Eggnog is made with eggs, sugar, a blend of spirits and milk or cream (or both). In a typical iteration, eggs are blended with sugar and booze creating a thick and sweet beverage, not unlike Baileys. From there, portions of milk and cream are added before serving. Some recipes call for whipped cream, while others fold in whipped egg whites. I took another route entirely and went for an aged eggnog recipe. The real benefit to aging the eggnog, however, can be tasted with each sip. More nuanced then just-made ‘nog, aging mellows the boozy nose of this super spiked beverage and makes for a harmonious, blended flavor. Smoother-tasting than fresh eggnog, aging the drink also turns the consistency thin, a nice break from the thick and cloying versions we’ve all come to expect from the store. To serve, you can of course fold in whipped cream, if you’re a frothy eggnog lover; just as you can use reduced fat milk if you prefer a lighter version. I add toasted star anise to the jar a few days before I plan to serve it—the warming spices embody all that is symbolic of the holidays in one. Combine all of the spirits and set aside. In a large bowl or standing mixer, add the eggs and sugar. Beat on low speed until all of the sugar has dissolved, about 3 to 5 minutes. Turn the mixer to the lowest setting and slowly add the spirits, drop by drop at first to temper the eggs. When all of the liquid has been added, strain into a clean glass jar (using a strainer will catch any solid bits of egg), cover and store in a cool dark place. Invert the jar occasionally, or at least every three days, for at minimum of nine days and up to three weeks total. Five days before serving, add the vanilla bean pod and star anise, if using. To serve: strain out the spices and place the eggnog mixture into a large bowl or container. Add the milk and heavy cream and stir to combine. To serve, shake a ladle-full (about ½ cup) of eggnog with ice until frothy. Serve immediately, over a lowball filled with ice and top with some freshly grated nutmeg. Rosehips are bright red ‘berries’ that form on the stems of rose bushes and trees after the blooms die back. These fleshy globes encase seeds for the roses and can be eaten raw or dried. Rosehips form in mid-autumn and are best harvested after the first frost. This homemade rosehip granola is best served over yogurt with a spoonful of honey. To learn how to harvest rosehips (November is a perfect month for it! ), check out this post. For more rose hip recipes and inspiration, check out this post for Rosehip Sherry. To the uninitiated, the mention of fish sauce might well result in wrinkled noses. However, the oft-misunderstood ingredient brings a welcome punch to a variety of dishes. Because fish sauce falls outside the flavor categories typically recognized by the American palate, the savory-salty taste is hard to define. The Japanese describe it as “umami”—roughly translated as “deliciousness.” At Ma‘ono, the mystery works. Fuller relies on fish sauce for his kimchi, adding it during the beginning stages of a three-day maceration, along with raw oysters, to give the cabbage a kick-start. This fiery relish is served with the fried chicken as an aromatic, fresh-tasting side. Fuller also opts for fish sauce—instead of the more traditional anchovies—in a version of Caesar salad. “I use it as a flavor like I would use salt,” he says. Why you should try it: A versatile pantry staple, fish sauce imparts a noticeable difference in recipes—and not just in the usual Asian fare. Use it in place of soy sauce or other pungent foods, like cheese. A splash can be added to sauces and broths for body. Where to find it: Fuller uses Three Crabs fish sauce at Ma‘ono. “It’s the best fish sauce we can get here. It’s high quality and it’s readily available,” he says. At home, he opts for Red Boat artisanal fish sauce, which is more of a splurge. Both are available at Uwajimaya stores (Bellevue, Chinatown–International District, Renton; uwajimaya.com). Three Crabs and other brands can be found at H Mart locations (Bellevue, 100 108th Ave. NE; 425.990.8000; hmartus.com). How to use it: A little goes a long way. “In moderation, it can elevate just about anything,” Fuller says. Try adding a spoonful to marinades and vinaigrettes. Combine lemon juice, olive oil and fish sauce and brush it over your veggie kebabs right as they come off the grill. Try a splash in your mac and cheese or risotto, in place of Parmesan. But, Fuller says, “Start with a few drops and taste as you go. Originally published in my book Apartment Gardening, this is one of my all time favorite recipes. This is also the recipe that was highlighted in this fun interview I did for the Wall Street Journal. (And YES, I still feel the same way about bacon.) With all that recipe sharing, I figured I should probably offer it here, too - right?! 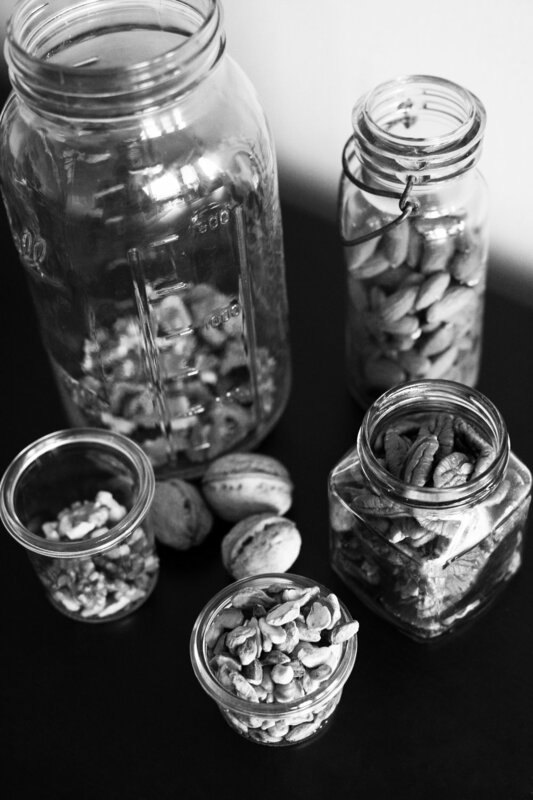 I often have a jar of this granola on the shelves of my pantry. It's a nutritious and filling topping for non-fat yogurt, making it an excellent choice for anyone trying to eat healthy or commit to a morning routine. My friend Lynda worked as a cheese maker at a goat dairy. A few summers ago I got to spend a few days out in farm country with her, and every morning for breakfast I had a deep bowl of her perfect goat milk yogurt topped with spoonfuls of her homemade granola and a drizzle of honey. Her granola has no added butter or sugar, so it’s not gooey-crunchy like most granola, but it does have toasty, flaky bits like coconut, oats, and almonds. The flavor is intensified with some chamomile buds and sesame seeds. After trying this, you’ll never think of granola in the same way again. 4 minutes. Serve by the handful over a bowl of plain yogurt with a drizzle of honey and some fresh fruit. Cooled leftover granola can be stored in the pantry, in a sealed container, for about 3 weeks. For MORE recipes using chamomile, check out my Chamomile Cordial recipe here. For TIPS on harvesting and drying chamomile for recipes or medicinals, check out my How-To guide here. This is the recipe for french onion soup perfection - that uber rich broth that holds velvety onions and is covered in burnt cheese. Le Pichet is in Seattle and a def must-visit if you haven't been in some time. Cannabis sativa is having a moment—from selling out in our first recreational marijuana stores to adding heft as hemp to vegetarian dishes around town. And while everyone is talking about the former, we’re here to celebrate the latter. Hemp seeds can be pulverized and used as a thickening agent for vegan-friendly “creams.” “If you add saffron to broth-soaked hemp seeds and purée them, you get a similar effect to a seafood saffron sauce,” as the omegas contribute a subtle fishy undertone. How to use them at home: Soak the seeds in liquid—broth, water or vegetable juice—for 15 minutes or longer. Purée and strain to remove any solid pieces of the seed. For adding creaminess to soups, plan to use about 1 cup of hemp seeds per every 1.5 cups of liquid. For salad dressing, add soaked seeds to a blender with fresh herbs, lemon juice and water, and blend until the desired consistency is reached—no need for oil, as the seeds add the fat. Where to find hemp seeds: Patterson orders them in bulk and recommends purchasing shelled hemp seeds, which break down more easily. They are sold as hemp hearts or shelled hemp seeds at most natural food stores, including Whole Foods Market (wholefoodsmarket.com; $21.99/pound). They are also available in 7-ounce (organic) and 8-ounce (non-organic) bags at PCC Natural Markets (pccnaturalmarkets.com, $10.50). Click here for Patterson’s recipe for smoked lentil sunchoke cake with black garlic hempseed sauce. The new year is a great time to recover from holiday indulgences. Personally, I'm so over food and drinks just now. Instead, I'm craving clean eating foods that I know will work through my system quickly and provide me with energy. (I've been counterbalancing bourbon with green juice for a week!) Craving fuel, January 1 is when I typically make a shopping list and stock up on frozen cut fruit for smoothies, bunches of leafy, winter greens and make sure I have some lean proteins available for adding to meals. Here, the good fats found in coconut milk satiate and homemade beef stock provides a calcium and phosphorous dense broth full of minerals providing a base for the Leafy Greens & Coconut Milk Soup. I fill a large, shallow bowl with torn spinach leaves, a handful of mixed herbs (whole cilantro, basil and mint are delicious and invigorating) and some finely chopped green onions. Add thinly sliced jalapeño for spice - they're especially great when you're fighting a cold as the capsaicin from the seeds (the compound that creates the spiciness) thins mucus and helps to open up your nasal passages. Pour hot broth directly over the greens - the heat cooks the greens, allowing the soup to come together in minutes. Keep the pantry filled with at least one can of coconut milk (look for a pure brand that avoids adding carageen - a seaweed derivative that is thought to be an allergen) and keep a container of stock frozen in the freezer, for easy meal-making. Place broth and coconut milk into a small saucepan and heat to boiling. Meanwhile, fill a large, shallow bowl with greens, as above. When broth is at a low boil, pour over the veg and serve immediately. For bone broth, check out this recipe for beef pho from Andrea Nguyen of Viet World Kitchen. For a simple chicken bone broth made at home in a slow cooker, here's a goodie from the ever-healthful Nourished Kitchen.